"Simply delicious. Quick and easy recipe for the busy homemaker. Serve with rice if desired." In a medium bowl combine the jam, dressing and soup mix. Mix together. Place chicken pieces in a 9x13 inch baking dish. 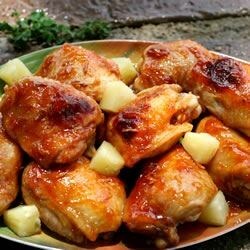 Pour apricot mixture over chicken and bake uncovered in the preheated oven for 50 to 60 minutes. Quick and easy baked chicken recipe with only four ingredients. This is a great recipe. I added pineapple chunks for the last 10 min and served it with rice and a garden salad.